Writing about an athletic event isn't my usual style, but I think people would like to know what running a 61 mile ultramarathon is like. I've been running for about ten years, doing alright at various 10ks, half marathons and marathons over the years. But, I'd never exhausted myself to such a degree that I had to stop moving. I'm curious as to where, precisely, my body's physical limits are. Presumably there's some moment where I've consumed every bit of energy available to me, where my muscles give up the ghost and I collapse to the ground in a unconscious boneheap. 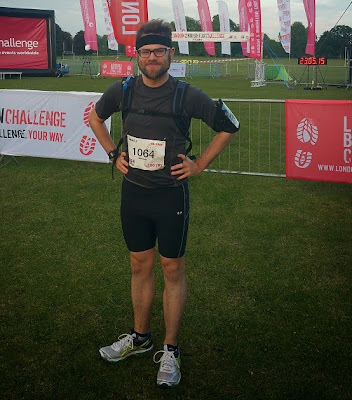 Finding that moment was why I entered this ridiculous 61 mile ultramarathon from Richmond Park, London to Brighton Race Course. I applied for entry way back in August of 2014, the lengthy wait making the idea of actually running that far feel like a mercifully distant prospect. Yet, as 2015 hove into view I had to start making plans. Setting aside my Sundays, I embarked on a lengthy, time-consuming training programme that saw me run back to my house in Central London from every terminus on the London Underground and spend countless hours bobbing about on woodland tracks on the periphery of the M25. Finally, with more than 400 miles of training under my belt I was (according to what I'd read) physically ready. 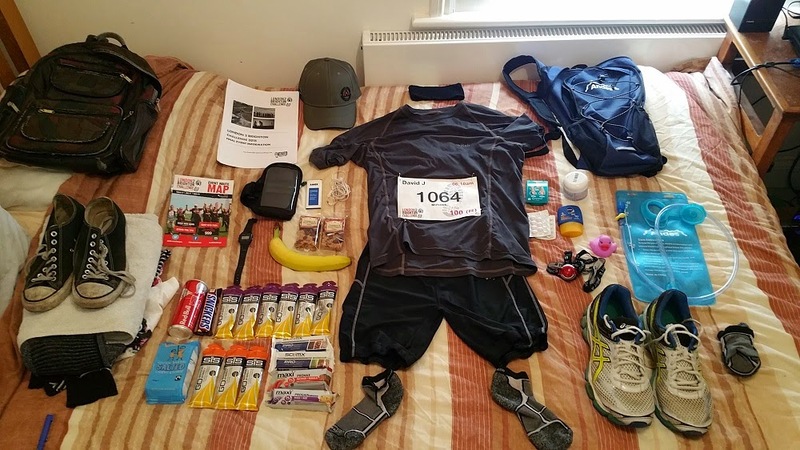 Doing something like this isn't some lazy run in the park - you've got to be prepared. I did my research and drew up a list of things I'd need in every eventuality. You can see the extensive results above, including many disgusting glucose gels, sports flapjacks, head lanterns, water bladders, painkillers, anti-friction creams and specially designed long distance running socks. It's a lot of stuff, but you don't want to be caught short 40 miles in and realise a £3 hat could be saving your life right now. 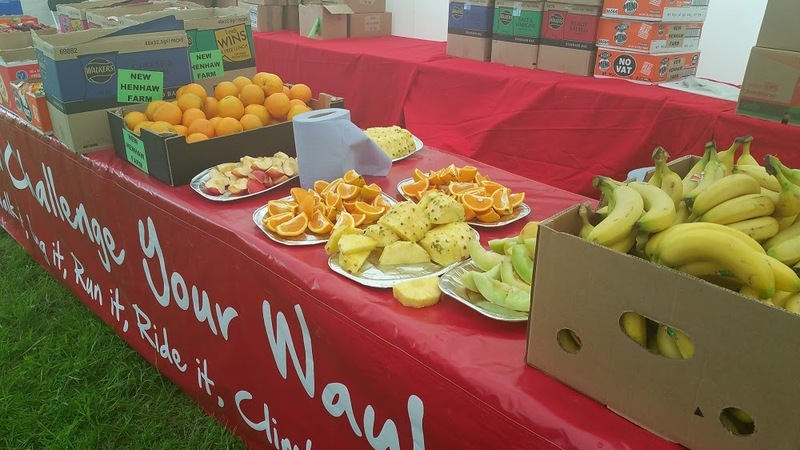 Similar levels of preparation had to be directed at my body the week before the run. My start time was 06:10, meaning I had to be awake at 04:30 to get a taxi to Richmond. This necessitated a week of waking up at 5am and mooching around in the morning twilight waiting for the day to begin. I also had to jam as many carbs down my throat as possible and avoid booze and anything especially gut-troublingly spicy. Eventually, all the prep was done and I found myself at the start line at 6am on Saturday morning. The sun was just under the horizon, the ground dewy and the temperature pleasant. I ignored the zumba warmup happening near the start and focussed on the sign saying 'Brighton: This way'. The final few minutes seemed to zoom by as I set up my GPS tracker, music playlist, stopwatch and pedometer. And them, before I knew it, I was away. The first ten miles were easy street. The sun was shining, I was surrounded by happy runners and watching the sunrise glitter off the Thames. I kept reminding myself to enjoy this easy bit as much as I can, to slow down and conserve energy for later. The elite runners swept past me off into the distance, as did many others. Every ultramarathon guide I read had advised me to 'run my own race', not to compete with others or let them dictate my pace. So I ambled along, pleasantly watching the numbers on the distance markers tick upwards. All too soon I found myself a quarter of the way through, at the 15 mile rest stop. I was in good spirits though trying to ignore a faint discomfort in my left knee and the bridge of my right foot. Experience had shown me that these aches and pains come and go as your body warms up, but even so, feeling even a glimmer of pain at this stage can't be good. After all, things are only going to get worse before they get better. By the time I'd run my first marathon of the day I could definitely feel the first symptoms of fatigue setting in. My calves and quads were tightening up in a familiar way, no doubt anticipating what would usually be the end of a long run. But I had a long way to go yet. Buoying me up was a rest stop fully stocked with treats - though I couldn't stomach half of them. I settled for a couple of slices of fresh pineapple - the most delicious pineapple I've ever tasted. Then, back to the trail. As the sun rose in the sky I approached the halfway point, tendrils of tiredness making their way around my body. 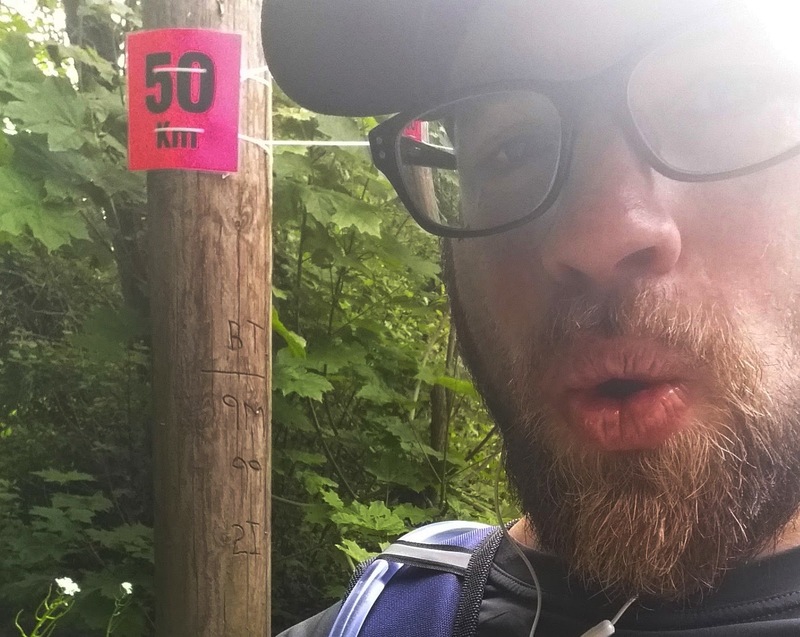 For the first time I began to experience psychological trouble as well - by this point I'd run 30 miles and felt like I'd come an awfully long way. Now I had to do that all over again. I grimly gulped down an absolutely foul sports flapjack and pressed on, switching up my gait in an attempt to stretch my calves out. At the 34 mile mark I hit the big mid-point rest-stop; Tulley's Farm. I stopped for 15 minutes, retrieved my backup bag and restocked my pack with snacks and water. There was a canteen set up with a buffet of delicious looking hot food, piles of pastries, a salad bar and sweets. I settled for a scoop Mediterranean curried pasta, some coleslaw and some cucumber. Unfortunately my numbed sense made it thick, goopy and cardboard-like - the pasta sticking to the roof of my mouth like glue. I swallowed what I could, disposed of the rest and headed back out. It was here that I switched up my music choices. Prior to this I'd stuck to low-key indie and film scores - music to lull myself into a trance. I wanted to try and disassociate myself from what was happening to me. But, frankly, the droning apocalyptic rhythms of Clint Mansell's score for The Fountain were getting me down. I made an informed and intelligent decision to switch to The Prodigy's 2010 live album World's On Fire. It turned out I hadn't. 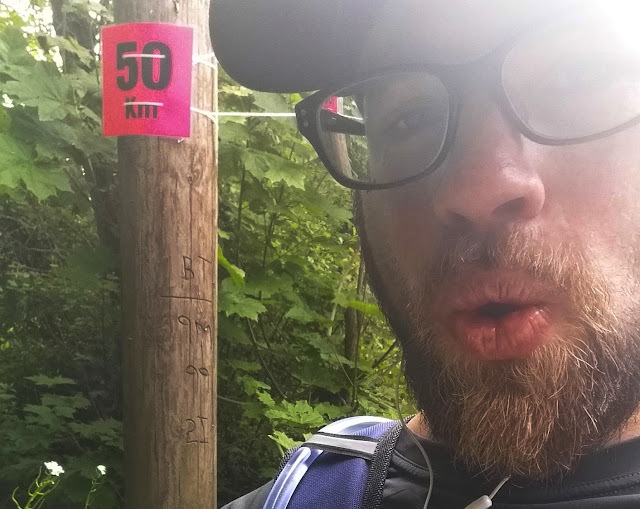 My bloated ego came a quick cropper at about the 50 mile mark, all vigour leaving my body like the last dregs of juice being sucked out of a drinks carton. Halfway up a gigantic hill my muscles polled themselves and unanimously decided to go on strike. I was reduced to a red-faced sweaty shuffle, feeling the beginnings of a light-headedness. I weaved a little on the trail, and as I reached the top I stopped for a moment to eat a chocolate bar and compose myself. This was bad. Worse than bad, but I didn't have far to go. Over and over again I told myself that each puny, slow step was one more towards the finish line. Spiky shard of pain were making a comprehensive world tour of my body, with lengthy stops on my back, kidneys, lungs, hips and groin. Even my teeth hurt! Worst of all, my traitorous legs were somehow beyond pain, more like lead weights under me; I'd never felt this damn tired before. I began distractedly muttering to them; "Look guys, I know I haven't treated you well these last few months, but I just need you to cooperate for a couple more miles and you can rest..."
Things carried on in this vein until the last few miles. Now I could see the sea ahead of me and, in the distance, the stand of the race track. I squeezed my eyes closed and pressed on as fast as I could, trying to convince myself that experiencing this exquisite exhaustion was the whole damn reason I'd signed up for this in the first place. Knowing that didn't help a great deal, but still, I inched ever closer to the end. Finally I made it onto the Brighton race track. I had family and friends waiting for me, and I didn't want them to see me in knackered agony. From somewhere, god knows where, I found some unused burst of speed, some injection of adrenaline as yet unused. I picked up to a sprint as I entered the final straight and, weirdly, it felt smooth, easy and relaxing - like gliding effortlessly through the air. 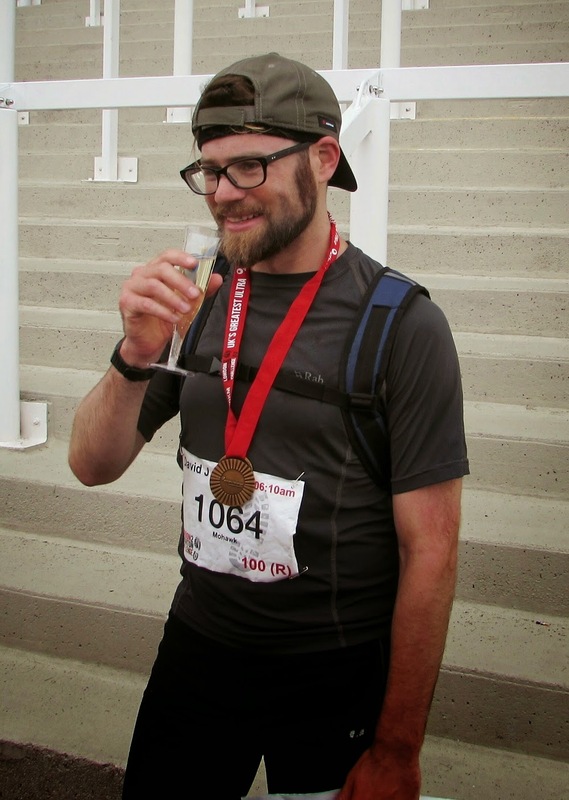 I finished, got my medal, a glass of Cava and hugged my family and had some photos taken. I was a bit dislocated, but happy to not be running any more. After an absolutely excruciating massage I began to shiver uncontrollably - though a hot chocolate sorted that out. Later, I hobbled out of there, pleased with myself for running 61 miles, but a bit numb and blown out. Though it'd taken me 13 hours to get here it felt strangely compressed, the trail melting together into one long procession of trees, runners, snacks and hills. My hope for the race was that it'd show me some part of my personality I'd never unearthed before, some primal, universal exhaustion that lies under all the civilisation. This didn't happen - I was switched on and felt like 'myself' all the way round. I still don't even know what my surrendering point is - maybe I can't reach it through running. Still, I do have the satisfaction in signing up to do a preposterously tough physical challenge, training my body to cope with it, preparing my equipment, organising myself and executing the plan without giving up. I finished it without blisters (thank you Trail Toes cream), without suffering any permanent injury and without consuming a single painkiller (which felt like cheating). I now know that I can do this kind of thing, and that I can push my body pretty damn far - which theoretically means I don't have to do it again.. right? This wasn't some world-shaking spiritual experience. 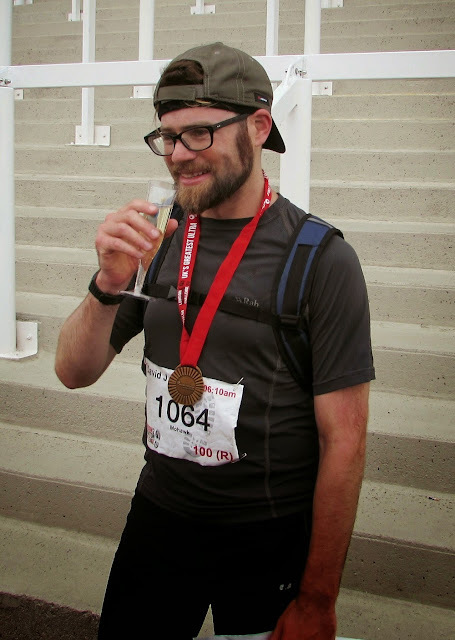 It was 'merely' an extraordinarily long, extraordinarily painful race - one that I can quite happily fit into the same continuum as every other race I've run. But it is extraordinarily satisfying - as far as challenges go I'd recommend every serious runner tackle an ultramarathon at some point, it's an experience like few others.